In AD 43, a Roman army of 40,000 men landed on the coast of Kent. Commanded by Aulus Plautius, they quickly marched on the British capital of Camulodunum (Colchester). 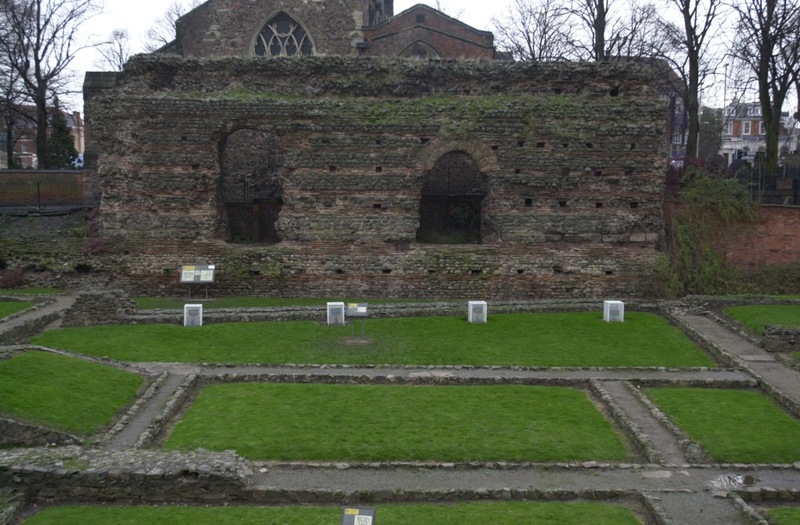 At the time, Colchester was the royal city of the Catuvellauni, the most powerful Iron Age tribe in southern Britain. It didn’t take long for the town to crumble, and the tribe’s chiefs were seeking an audience with Emperor Claudius to determine terms of peace. The majority of southern British tribes quickly submitted to their imposed new emperor, as Iron Age warriors proved no match for the might of Rome’s military machine. Each conquered settlement became a Roman fort, linked by a network of straight roads to allow the easy transportation of supplies and men. After conquering most of southern Britain, the Romans headed towards the Midlands. 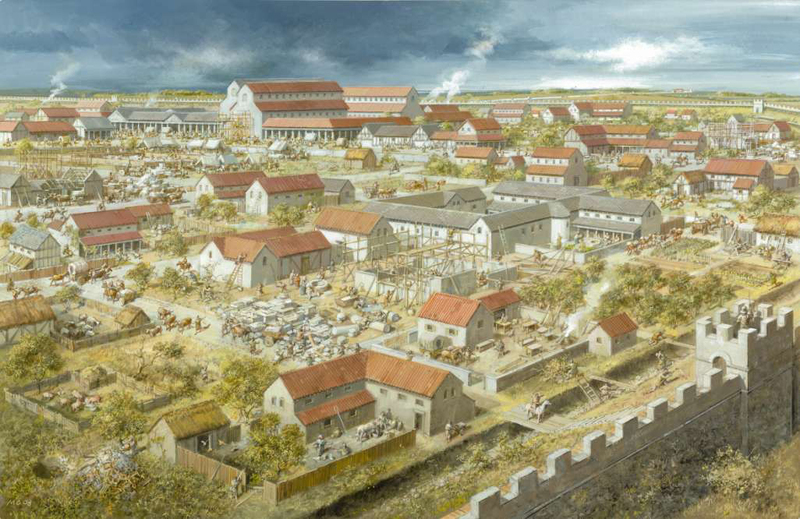 Legion XIV of the Roman army marched from Colchester along the new, Roman-built Gartree Road, through Cambridge, Godmanchester and Medbourne before reaching the famous Fosse Way Frontier at Leicester. The Romans were aware of the tactical importance of Leicester. It was situated in the heart of the country where roads converged, and with an important river flowing through it. Iron Age ditches and ramparts show that the native tribe put up a defence, however, it probably didn’t last very long. It is believed by archaeologists that a Roman military base (or fort) was established on the eastern bank of the Soar, just below the native Iron Age settlement, and became the new home of the conquering Legion XIV. The fort housed about 500 men and was surrounded by a ditch and earthen rampart. It was built to guard the intersection of two of Britain’s greatest Roman roads – Fosse Way and Gartree Road – at the river crossing. With the arrival of the Roman army, came money. Traders and other settlers gathered near the fort. A minor civilian settlement such as this was called a vicus. A second fort was constructed between AD 55 and AD 65 to the northeast of the earlier one. This is thought to be a response to a British revolt led by Queen Boudicca in AD 60-61. As a town with two forts, the British Queen would think twice before attacking the strategic lands of Leicester. Leicester was unaffected by the Boudicca uprising however, and between AD 71 and AD 85, the province more than doubled in size. But in AD 83, the Roman occupation began to evolve. The Roman army in Britain was considerably weakened by a sudden recall of men to the continent. By AD 92, Britain had lost its major Roman legions. The Leicester forts were evacuated and the town was no longer a military stronghold. But it remained under Roman rule. As the soldiers departed, the forts were dismantled and land handed over to civilian use. The vicus of Leicester was granted the power of local legislation and became a civitas capital of Britain. That meant it was an administrative centre of a tribal territory – in effect, the capital of the East Midlands. Leicester was now known as Ratae Coritanorum. Geographer Ptolemy, writing in the second century AD mentions Ratae and Lindum (Lincoln) as being the two leading towns of the East Midlands’ native Corieltauvi tribe. Ratae is a Celtic word meaning “ramparts”, the earthen banks built to protect a site. It most likely refers to the pre-Roman defences. Coritanorum means “of the Coritani (Corieltauvi)”. Civitas capitals were administered by a council known as the Ordo, with elected officials. Such settlements were a means through which Roman institutions and ideas could permeate into Britain. Ratae had modest beginnings. Streets were constructed in a regular grid pattern, with shops and other timber structures built along the main roads. Fosse Way and Gartree Road ensured a means of transport in and out of the town, and imperial coinage was the common medium of exchange, replacing the tribal currency. As the town grew in affluence, the town council decided to indulge in an expensive building programme to improve the town’s image. The decision to rebuild Ratae is thought to be prompted by Emperor Hadrian’s visit to Britain in AD 122. He was credited by his biographer, Spartianus, with “putting many things to rights” during his tour of the province. The timber buildings of Ratae were demolished and the area was levelled for redevelopment. The forum (open market place) was built in the centre of the town, with the basilica (town hall and law courts) on one side, and colonnades and shops along the other three sides. These public buildings were completed some time after AD 125. Leicester’s new buildings had massive foundations of granite brought from the nearby quarries of Enderby, Groby and Mountsorrel. The architectural details, such as plinths and columns, were fashioned from Millstone grit from Melbourne, in Derbyshire. 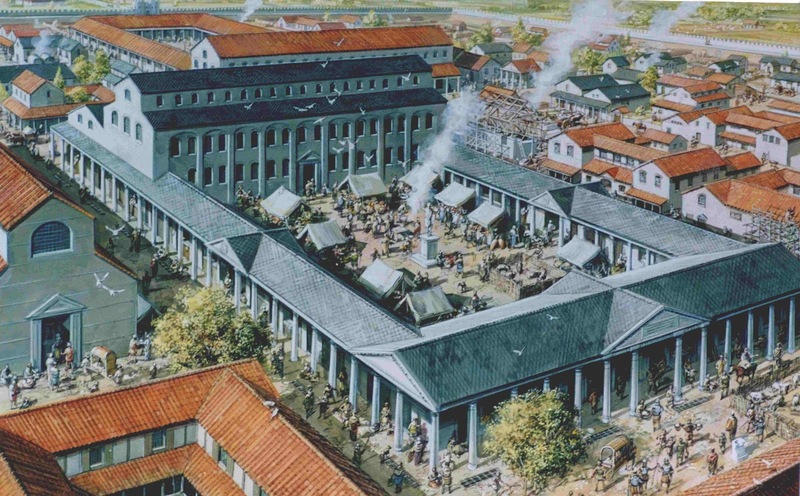 The construction of an exercise hall and public bath house, just to the west of the forum, were next to be built in the growing town. They were completed some time after AD 160. The central portion of the west wall of the hall had two arched entrances into the bath house. The wall survives today, standing at a height of 12 metres and being up to two metres thick. It is Leicester’s most famous piece of archaeology. We all know it as the Jewry Wall. The Jewry Wall is one of the finest examples of Roman building structures to remain in Britain. The wall is faced with carefully squared stone and has a rubble core. Courses of brick appear at frequent intervals serving to level off the irregularities of the stone work. It also has a semi-circular niche large enough to have contained a life-sized statue between the arches on the inside of the exercise hall. Today, the bath house has been fully excavated and its plan remains uncovered on the site for visitors to see. The Roman system of bathing was similar to that known today as the Turkish bath. There would have been a series of vapour-heated rooms. A cold room with little or no heating, a moderately heated room, and an extremely hot room which had a hot plunge bath. The bathers moved through the rooms of varying heat and having cleansed themselves, rubbed their skin with oil. The Jewry Wall bath house is the only one known in Britain which has twin changing rooms, latrines and baths. The separate bathing facilities may have been designed to allow both men and women to bathe in the building at the same time. 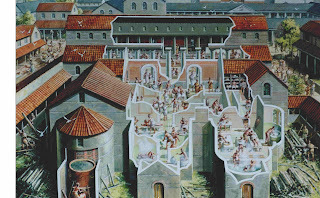 Bathing in Roman times was a leisurely process. The bath house was a social centre, a place for meeting friends and exchanging gossip. A large quantity of water was needed for the baths to function and also for general everyday use of the growing Roman town. So an aqueduct was built to bring water to the town from Knighton Brook, about two kilometres to the south of Ratae. A section of this water channel with retaining banks survives today, close to the Walkers Stadium. It is known as the Raw Dykes. The course of the aqueduct ran on the east side of the river Soar up to the south-west perimeter of the town. The ground slopes naturally downwards to this point. As the town was situated on a slight rise, the water could not reach the buildings by open aqueduct and was probably stored in water towers or reservoirs. Water was also obtained from wells – one was found at St Nicholas Circle. How water was distributed to the rest of the town is unknown, but it was usual for it to be piped underground to public fountains, one of which was found by archaeologists to the east of the forum. During the regeneration, numerous town houses were built for the members of the council or Ordo, whose duties may have required them to have a residence in the town. One particularly fine house was built to the north of the baths. An exquisite mosaic from the dining room of the residence is now on display in the Jewry Wall museum and is known as the Blackfriars Pavement. The intricate patterns are made of small pieces of coloured stone and pottery and remained hidden until 1832, when it was uncovered in the basement of a house. Leicester’s largest town house was uncovered recently in excavations at Vine Street. The house is second century in date and is the largest Roman building ever found in Leicester, being 230ft long. It had mosaic floors, painted walls, heated rooms, and a bath suite and could have been a hotel for officials. It had about 30 rooms, around a central courtyard, served by corridors. Some people of the civitas capital of Ratae were living the Roman high-life and the success of the Roman administration of Britain is evident. But the good life didn’t last very long. By the third century, the town appears to have reverted to being mainly a commercial centre, with elegant town houses being turned over to industry. 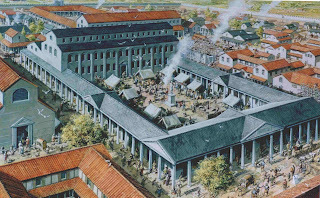 A second forum and a market hall were built to meet the increase in trade, the principal forum was altered and additional shops and offices were built. The third century was a time of general peace and prosperity in Ratae. Nevertheless, it was decided to replace the earthen ramparts surrounding the town with a stone wall, to create a more permanent form of defence for its 5,000 inhabitants. Public entertainment was an important feature of Roman town life, and normally there was a theatre or amphitheatre, sometimes both, and possibly a racecourse. These are usually found within or just beyond the town boundary. Although they have not yet been located in Leicester, entertainers were certainly in the town. We know of a Leicester-based gladiator, from an inscription scratched on a piece of pottery reading: “Verecunda wife of a gladiator and Lucius, Gladiator”. Gladiatorial contests were very popular and were usually held in amphitheatres – arenas surrounded by banks of seating. A gladiatorial show is depicted on fragments of a first century glass cup found in Leicester. Latin was the language of the Romans, and was commonly used in Britain. Working people of Ratae could read and write it, as seen from various engraved Roman tiles. One tile depicts the entire Latin alphabet, while another records the amount of slates made by a worker called Primus. 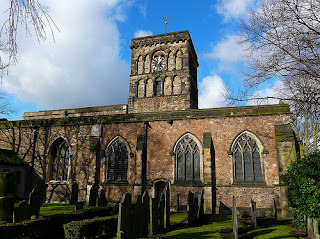 The Romans were religious people and in Leicester, a late second or third century temple stood at St Nicholas Circle. It is thought to have been dedicated to the Persian god Mithras. A collection of coins found on the floor of the temple indicate that it went out of use some time after AD 366. Various religious sculptures and architectural fragments have been found in the city and it is likely that there was more than one temple in Ratae. One such fragment shows a god holding a spear, standing in an arcade. He is wearing a conical cap and is thought to be one of the sons of Zeus. Part of a stone altar was also found depicting a sea god. However, the most amazing religious finds were discovered in 2006. Two inscribed lead tablets were found by archaeologists in an excavation of Vine Street in the city. One of the tablets is a curse and dates back to the second or third century. It asks for the god Maglus to find out who stole the cloak of someone called Servandus, and destroy him in nine days. Curse tablets are only usually found at temple sites, so the find may pinpoint another Roman temple in Ratae. Although the Romans brought a pantheon of gods with them, the native British gods were still worshipped. One piece of evidence is a statuette of a three-horned bull, which represents a Celtic bull-god associated with water. It was Roman law to bury the dead outside the town. A number of cemeteries have been found, including one on Churchgate. Cremation and burial practices were both common. Various urns, stone and lead coffins containing skeletons have all been found. Bodies were often accompanied by small drinking vessels, pottery jugs and other possessions to serve the deceased in the after-life. The official abandonment of Britain as a province of the Roman Empire came in AD 407, at a time when there was mounting barbarian infiltration all over the empire. In Britain, although the administration and economy of the country collapsed, British leaders gained control and managed to maintain the civilised life. To stop barbarian infiltration, they called upon the Saxons for military assistance in return for land. This policy proved successful until AD 440 when the Saxon settlers revolted and waves of barbarian invasions began. There is clear evidence that Saxons were in and around the town from the early fifth century onwards, but little is known about what happened inside the town after AD 407. 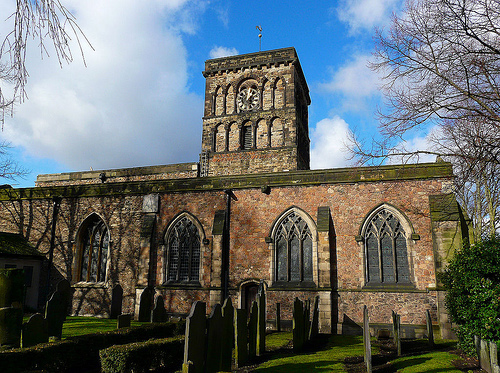 In time, all of the Roman buildings decayed and were eventually demolished so the stone could be re-used, such as for the construction of St Nicholas Church, which contains red bricks from a Roman structure. But by some miracle, the Jewry Wall has stood for nearly 2,000 years – the most visible sign of, and long may it stand as, a memory of almost 400 years of Roman occupation.